There have already been three editions of the competition, which is addressed to writers as well as to those who are just starting their career in literature. The competition's goal is to set high standards of literature for children, provided by the literary works of Astrid Lindgren, the Patron of the contest. The form and theme of books taking part in the competition are free. They should be interesting and meaningful, as well as comprehensible for children. They ought to teach them to think, touch the deepest hearts and protect their sensitivity, helping children develop self-confidence and a positive attitude towards the world. All winning books are published by major Polish publishing houses. In this way, Polish children book market has been enriched by 18 valuable books. The competition is organized in a three-year-cycle. The competition was twice held under the patronage of Minister of Culture and National Heritage and the panel of judges was twice chaired by prof. Joanna Papuzińska, a literary scholar and writer. Works can be entered in the competition in three age categories: for children below age 6, age 6 to 10, and age 10 to 14. 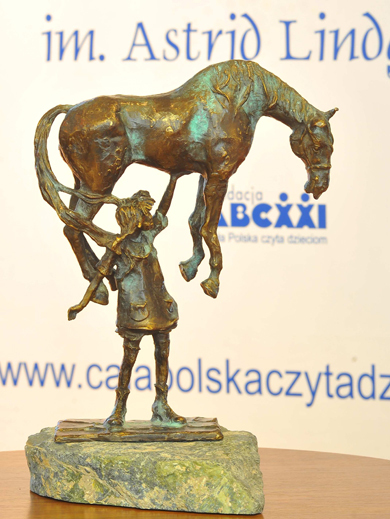 The winners are awarded financial prizes The Grand Prix in the competition is a sculpture of Pippi Longstocking lifting a horse, made by the renowned Dorota Dziekiewicz-Pilich.